Happy Valentines! 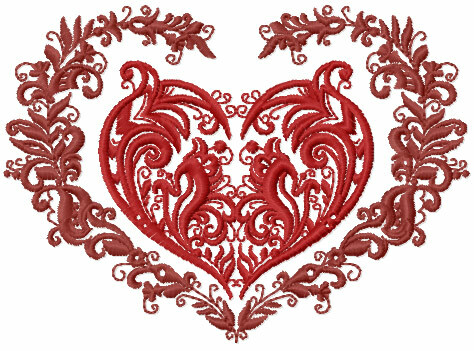 Don't forget about our annual Valentine's Day Sale on Sunday, February 15th from Noon - 5:00pm. Come in for some cookies and chocolate and check out the great deals. We will have all yarns and needlework charts in stock on sale 20% off, with special sales throughout the store. All sale yarn priced from 20% -50% off will be 30% - 50% off the original retail price that day. Hope to see you here! If you are from out of town, please call us toll free at 1-877-384-8781 to take advantage of the sale. This wonderful book reinvents vintage embroidery through a modern aesthetic. Includes 25 embroidered patterns demonstrating the beauty of traditional designs while keeping the projects fresh and modern looking. Step by step instructions and templates are included in the book. A beautiful book for free form surface embroidery . In this book, Hazel uses a selection of materials to update techniques and inspire embroiderers to explore whilst working loosley within the confines of crewelwork styles. One of the projects in this book is Midnight Meander, a gorgeous design that incorporates numerous embroidery stitches, silk threads and beads. This book continues the concepts in "Crewel Twists". The book contains 4 large projects with accompanying small projects. Each project is clearly explained and uses several embroidery techniques including bead embroidery and needle lace. You can create some modern, creative designs with free hand embroidery. All you need are the right tools and your imagination. The Crazy For Crewel kit below, "Fishy Fishy" is sold as a complete kit with wools, needle, printed twill fabric and buttons. Complete instructions included. See other Crazy For Crewel kits here. This pillow pattern is from The New Crewel, the Motif Collection book, with CD. Included are other contemporary patterns in this style. Book available in store. We carry all the supplies you need to get stitching including books, stitch guides, silk, cotton, and overdyed threads, metallic threads, needles, hoops, and fabrics. See here for Accessories, threads, and fabrics.